So, your company wants a Facebook page… Facebook, with its 750 MILLION active users, is “the place to be” online, and the cornerstone of many corporate social media efforts. You’ve probably had your personal page for years; maybe you’re hooked on Farmville, you enjoy keeping track of old friends from high school, or you use it to coordinate your kid’s busy social life and share photos with friends. Whatever you use Facebook for now, the way to use it as a business is different, and for good reason. I’ll be describing some of the things you should keep in mind along the way, as you set up your company’s Facebook Page. One of the most common mistakes I see is when a company sets up a personal account like it’s a person: first name Miller & Sons, last name Painting. 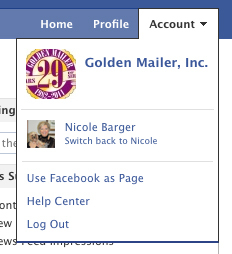 One quick way to tell is to see if, at the top of the page, you see a “Send Friend Request” or a “Like” button. Pages allow people to “Like” them, and personal accounts add friends. When someone “friends” you on Facebook, the information that you’re allowed to view is different than what’s available to you when they “like” your Page. As a Page, you have fans instead of friends, and you’re limited in that you might not see their status updates or the photos they share, but the information that you gain access to is invaluable to a business looking to track the effectiveness of their Facebook campaign. If you ask me, the best thing about a Facebook Page is their Insights feature. It tracks what kind of reaction your posts are getting; it shows you, on an easy to understand line graph, when you’re getting new fans, and when you’re getting comments and likes on what you’re posting. It breaks down all of that information and shows it to you, right inside your Facebook account. Besides being able to see this information, you can export this data to an Excel file to track it long term. It’s also nice, from an efficiency standpoint, to be able to switch back and forth between your personal account and your Page. Just click on your name to switch accounts! When you’re set up as a Page, you can grant other people access as an Admin, so you aren’t the only one responsible for posting content. Have someone else assigned as an Admin and they can also post on your behalf, so your account doesn’t sit ignored just because you’re on a much-needed vacation! Now that I’ve sold you on the benefits of a Facebook Page instead of a personal account for your business, the next step is setting it up! Come back next week for step-by-step instructions on how to do that, and please feel free to leave any questions you might have about Facebook, and I’ll do my best to help you out! Great information here! I didn’t know anything about FB for business use until I read this. Now, I’m confident that I can use it as an effcetive tool to advertise my blog and my services. Hi Keith! Thanks so much for stopping by! I hope the second part of our Facebook for Business series is helpful as well! These posts barely scratch the surface of what Facebook can do for your business! It really is worth the time you might put into it to learn how it works!